This chapter presents a comprehensive analysis of the 3,099 U.S. counties’ adoption and diffusion of e-government and the functions provided by their Web sites. By using content analysis methodology, the services and functions of U.S. county e-government Web sites are investigated and analyzed. The research finds that U.S. counties’ e-government adoption is highly associated with socioeconomic factors; in addition, the functionalities of local e-government Web sites are significantly related to multiple socioeconomic factors according to the regression analysis. The chapter provides government officials and practitioners a comprehensive picture of U.S. local e-government practice. It sheds light on e-government research by bringing in a valuable research instrument and comprehensive analysis of e-government adoption and diffusion. For many years, the United States governments at all levels have strived to improve their service quality and reduce operational costs by adopting advanced information technologies (Ho, 2002; Huang, 2006; Moon & Norris, 2005; Norris & Moon, 2005; Peristeras & Tarabanis, 2000). When the Internet is widely accepted and used, e-government has been adopted as an effective and efficient approach to support public governance. E-government refers to the transformation of traditional public sector services and processes into an electronic format with greater accessibility and interactivity to citizens (Huang & Bwoma, 2003). It uses the Internet to bring citizens, businesses, institutions, and governments together. The benefits of e-government are tremendous, including reducing government spending, increasing interest earnings, improving delivery of government services, and promoting democracy etc (Huang & Bwoma, 2003). According to Watson & Mundy (2001), for instance, e-government can significantly reduce government transaction costs. In their study of property tax payments, Web-enabled payment reduced processing costs from more than 5 U.S. dollars to around 22 cents per transaction. The potential savings of e-democracy could be as much as $110 billion and Euro 144 billion a year when $3 trillion exchanges happen between citizens and U.S. governments each year (Watson & Mundy, 2001). Other research reports that e-government can transform bureaucracy form and allow public sectors focus on user satisfaction and flexibility in service delivery (Ho, 2002) and can support businesses (Gengatharen & Standing, 2005). Most e-government research has focused on the e-government practices at national and state levels (e.g., Ciborra, 2005; Criado & Ramilo, 2003; Holliday & Yep, 2005; La Porte, Demchak, & Friis, 2001; West, 2004), seldom investigated local governments’ efforts (Moon & Norris, 2005). Less was systematic empirical analysis of e-government services (Moon & Norris, 2005; Musso, Weare, & Hale, 2000). Because of the lack of comprehensive data about e-government practice, Moon & Norris (2005) contended “few rigorous empirical studies on e-government have been conducted” (p.56). Besides the shortage of empirical studies in the field, the research methodologies used by previous studies also constrained their contribution. Many studies examined the phenomenon merely from internal perspective, i.e., government officers and employees’ attitudes toward e-government (e.g., Koh & Prybutok, 2003), few studied the e-government practice from external angle, i.e., citizen’s perspective. While studies from internal perspective can bring insights to the literature, objectivity may not be achieved if the investigation is focused on the internal factors alone. There is often a gap between what the government officials initiate and what are really delivered to the citizens. From this point, government officials also need an external and objective feedback on their e-government efforts. This chapter conducts a comprehensive content analysis of U.S. counties’ e-government portals. 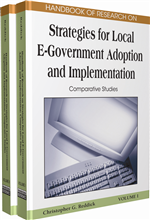 It evaluates the status of e-government practice at the local level in the U.S. The content and functions of U.S. counties’ e-government websites are evaluated based on a research instrument. There are totally 1,744 e-government portals in the 3,099 U.S. counties found, coded and analyzed. The chapter is organized as follows. First, relevant literature is reviewed and research questions are introduced. Second, theoretic foundation is discussed; an explorative research framework for e-government adoption and diffusion is established and research propositions are presented correspondingly. After that, research methodology is explained. Data analysis and results are presented in the fourth section. Lastly, contributions and limitations of this chapter, as well as implications for researchers are provided in the conclusion section. Diffusion: Refers to the process after the adoption of e-government website. During e-government diffusion, a government improves its website by linking to more departments and providing advanced functions. Content Analysis: A research technique for the objective, systematic, and quantitative description of the manifest content of communicator which has been intensively applied in the research of consumer behavior, public communication and media analysis. Portal: An official entry website that contains information about and links to the services provided by all administrative departments and agencies. Website Evaluation: Refers to the study of the content and structure of websites. Adoption: Refers to the launch of an official government website as a means of serving and communicating with citizens. E-Government: The transformation of traditional public sector services and processes into an electronic format with greater accessibility and interactivity to citizens. Stage Model: A conceptual model delineating e-government development patterns, which consists of four stages: information, communication, transaction, and democracy.